The 2017 Tokyo Auto Salon (TAS) witnessed a wide array of aftermarket and custom dress-up parts from various automakers in Japan. Among the lineup is Toyota Racing Development’s (TRD) newest (and smallest) crossover – the C-HR. Although, this didn’t come as a surprise, unlike the Hiace TRD concept that also made its debut at the 2017 TAS (but that’s another story). The C-HR has a youthful and active design even without the kits and customization. We could almost imagine how the engineers from TRD battled it out to be the one to dress-up the C-HR. 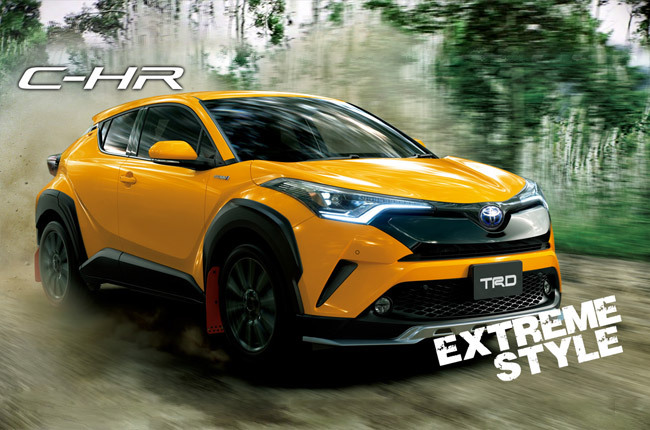 TRD customized the C-HR in 2 different ways, with different characteristics that are ready on- and off-the-road. Although, both cars share the aggressive fascia, huge side skirts, and rear spoilers for that added aerodynamic efficiency. As seen on the video above, the C-HR TRD Aggressive Style in white is fitted with accessories that are ready for the track. It also has a larger roof and trunk lid spoilers, as well as clad diffusers that complement the race-ready look with performance-driven kits. Toyota also said that the volume added to it makes the car seem to have a low center of gravity without lowering the car itself. On the other hand, the C-HR TRD Extreme Style lives up to its moniker with accents that are usually found on rally cars such as red mud flaps, front spoilers, and blacked out rear bumpers. The wheel arches has also been emphasized with black over fenders for that macho, outdoor-ish look. With these two enhanced C-HRs emerging, we can’t help but wonder if they will ever reach the local showrooms and stir the local subcompact crossover market currently led by the Nissan Juke, Ford EcoSport, Chevrolet Trax, among others. We’re pretty sure fans of the market will love its upgraded look.